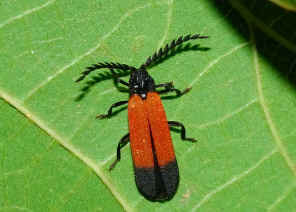 Small Bi-colour Lycid Beetle II - Trichalus sp. This page contains information and pictures about Small Bi-colour Lycid Beetles that we found in the Brisbane area, Queensland, Australia. 1. A guide to the Genera of Beetles of South Australia Part.4 - Matthews, E.G. 1985, p8, plate19.